Early last Thursday (12th May) I went out to the north end of the K-colony to do my morning census (a good spot to get an accurate count of the terns). The numbers have levelled off at c.90 adult Little Terns since my last post, with approx. 70 in the K-colony & 20 in the N-colony most days. At this stage of the season, birds who haven't found a mate yet roost out on the foreshore near The Breaches whilst paired birds can be seen higher up on the beach displaying, carrying sandeels & digging some 'test' nest scrapes. Female Little Terns wander around the beach looking for suitable nest sites, often sitting down in one for a few minutes to see if they like it. The males are nearly always close by, following their mate & generally carrying a sandeel for her (how nice!). Sometimes the females can look like they're sitting on eggs when testing out nest scrapes but they often get up & waddle on a short while later. 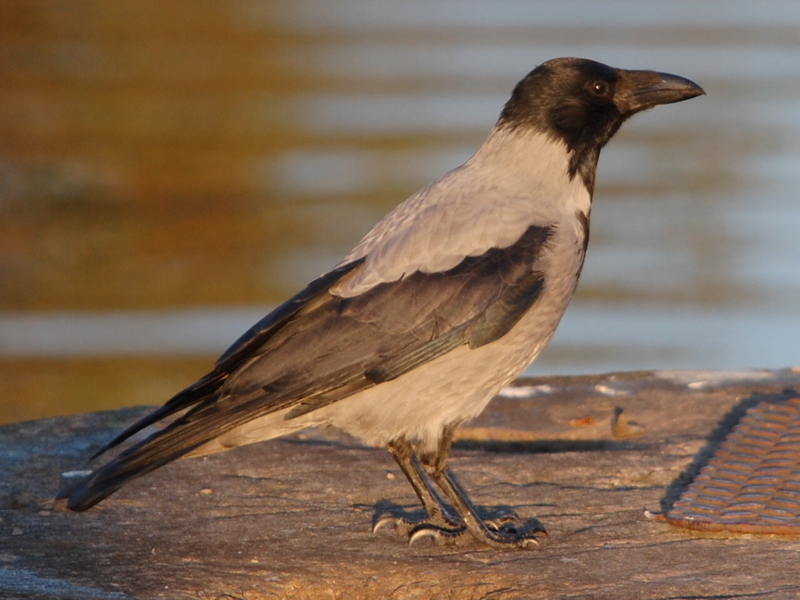 Birds who are actually incubating eggs sit low & tight with their wing tips often higher than the level of their head. On Thursday morning, I spotted one tern doing just that, high up the beach in amongst some dried seaweed looking suspiciously like she was incubating! So I kept on eye on her for a while and there was no getting up & waddling off to test a new nest scrape or even a male in attendance with a fish....more suspicion! Then all the terns took flight off the beach for a bit of a dread & sure enough, the tern I was watching arrived back & landed in the same spot, pointing her beak under her belly & shuffling down as if she was readjusting something underneath her....AN EGG!!! I went in to check the nest site & sure enough there was a single egg all right! The relevant nest details (position, scrape size, substrate, extent of decoration etc.) were taken & it was marked as K1. I was overjoyed at the sight of the first egg of the season but at the same time was suffering from a 'mild' bout of panic...THE FENCE ISN'T FINISHED! The average laying date at Kilcoole is the 19th May & the first eggs are always found a day or two around that so needless to say we weren't expecting any at all this early! I ran back & burst into Jason's caravan, waking him up with "WE HAVE EGGS!!!" and ran back out again to the colony to look for more nests! Sure enough I picked up another tern sitting low & tight so I went out to check if she was on eggs. Every step you take when in the colony has to be a calculated one as there's always the risk of trampling an egg or chick that you're not aware of if you're not careful. On the way out to check the potential new nest I had my eyes glued to the shingle as I suspected there may be some Ringed Plover chicks knocking about & I couldn't believe it when I came across another completely different tern nest scrape with a single egg in it! So I marked this new one as K2, proceeded to make my way towards the original possible nest when I happened upon ANOTHER unknown nest with a single egg, K3! Sure enough the nest site I was originally going to check was active & even had 2 eggs in it, K4! Little Terns stagger their laying with a new egg laid every second day or so until there's (usually) 2 or 3. They don't begin incubating properly until all the eggs have been laid so it's often quite difficult to pick up on new nests with the first egg as the birds spend very little time on it during the day so your chances of finding it are much reduced. I was just lucky to have found K2 & K3 on the way out to K4, but then again the terns do nest in little close groups or clusters like this. The fact that K4 had two eggs in it also means that the first one was most likely laid on Tuesday (10th)! There was a bit of a mad dash to get the fencing finished around the K-colony as soon as the first eggs were discovered & we went right ahead & enclosed the N-colony with the remaining flexi-net, rope barriers & signs even though no nests were found in it at that stage but it's a good thing we did as the next day I found a Little Tern nest there (marked as N1)! 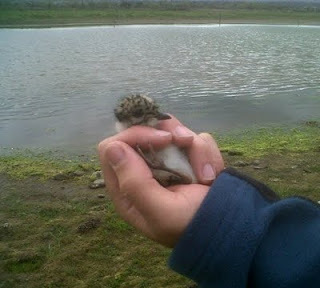 The total number of nests found increased from 4 on Thursday to 8 on Friday, 14 on Saturday, 19 yesterday & 25 now today! Some birds have finished laying and are now incubating their clutches of 2 or 3 eggs whilst other birds are still busy popping out fresh eggs! All this early laying should hopefully result in the first hatching sometime around the first week of June & should give the young as much time as possible to strengthen up before making their first journey to Africa (although lets not get ahead of ourselves here, we still have another couple of weeks to get through before we can even think about hatching, let alone fledging!!!). There are always set backs along the way and I'm afraid to report that we've already had our first predation. Whilst out doing nest checks today, Jason noticed that two of the nests right at the south end of the N-colony (N1 & N2) were missing their eggs! It's hard to say for definite what was the cause was but it seems likely that a Hooded Crow may have been responsible. The eggs were taken clean out with no traces of eggshells or spilt yoke in the nest scrape. Foxes & Hedgehogs eat eggs at the nest scrape and leave a mess whereas crows take them away to eat. I have seen a Hooded Crow a couple of times in this area over the past few days but the terns & Oystercatchers were always quick to chase it off. Jason did manage to find a piece of eggshell further up the beach so it's likely that the eggs were consumed there. With the colony stretching a full 1km between the north end of the K-colony & the south end of the N-colony, it can be hard for the one warden on duty to chase off crows effectively so this is where volunteer wardens can come in handy! Please feel free to get in touch if you wish to do a few hours wardening for us at any stage over the summer (e-mail us at littletern@birdwatchireland.ie). Thankfully the terns from N1 & N2 who lost their eggs still have plenty of time to start again at a second second clutch so we should expect to see them mate & relay during the week. 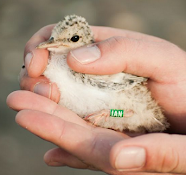 As it stands, the current tallies are 23 active Little Tern nests with 52 eggs! 19 of these nests are in the K-colony with the remaining 4 nests in the N-colony. A second pair of Oystercatchers have laid 2 eggs in the K-colony whilst the first pair in the N-colony are still incubating their 3 eggs. 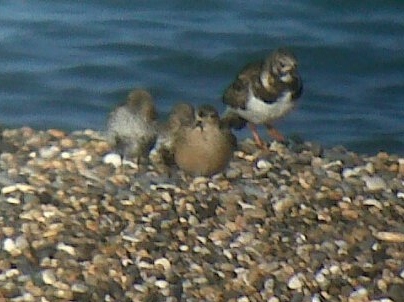 We've still got 3 pairs of Ringed Plover in the K-colony plus another 2 pairs in the N-colony. Up to 8 pairs of Lapwing have bred in the fields behind the tern colony & Jason was lucky enough to find a chick near the caravans yesterday! The 2nd calendar year Hobby that I mentioned in my last post made a re-appearance on Friday morning as it was seen drifting north from Six Mile Point over Stringer's channels. There has been no sign of the Marsh Harrier since last Tuesday but it turns out a second female type was also seen that day, flying south over Six Mile Point. An adult Peregrine made a swoop over the K-colony yesterday & tried to catch an adult tern, but thankfully failed! The male Kestrel continues to hunt along the dunes catching Viviparous Lizards and up to 3 Buzzards have been seen soaring over Stringer's farm along with a Sparrowhawk on a couple of occasions. A ringtail (i.e. female or immature) Hen Harrier was also seen yesterday. A Buff-breasted Sandpiper came in off the sea & landed in The Breaches on Tuesday evening (11th) which was a nice surprise! They are a rare but regular migrant from North America in Autumn but Spring records are more unusual (turns out others were seen in Wexford & Mayo too at the same time). It only spent about half an hour on site before flying off north. We also saw it give a couple of wing displays to nearby Turnstones which is something I've always wanted to see! A Barnacle Goose in Webb's field on Thursday was probably a feral bird or an escapee from a collection somewhere. Other highlights over the past week include a summer plumaged Great Northern Diver offshore from Newcastle & a female White Wagtail on the beach yesterday, a nice northward passage of Whimbrel (53 on Saturday) & Sanderling (12 on Friday), 50+ Dunlin feeding in The Breaches at low tide & 3 Wheatears on the rocks there too. A large swarm of St. Mark's Flies is present on the sheltered side of the Buckthorn bushes being gobbled up by Swallows, martins & Swifts. Lots of butterflies about too, mostly Common Blues & Green-veined Whites but also a Small Copper & 2 Painted Ladies. The Otter has only been seen late in evening over the past couple of days & 2 Bottlenose Dolphins were seen close offshore, travelling north past the K-colony at 11:20 on Saturday (these were most likely the 'resident' pair often seen around Dalkey & Killiney Bay).